Bamboo body pillow goes to great lengths to support you while you sleep. Whether you’re a side, back or stomach sleeper, it conforms to your every curve for custom comfort from head to toe. 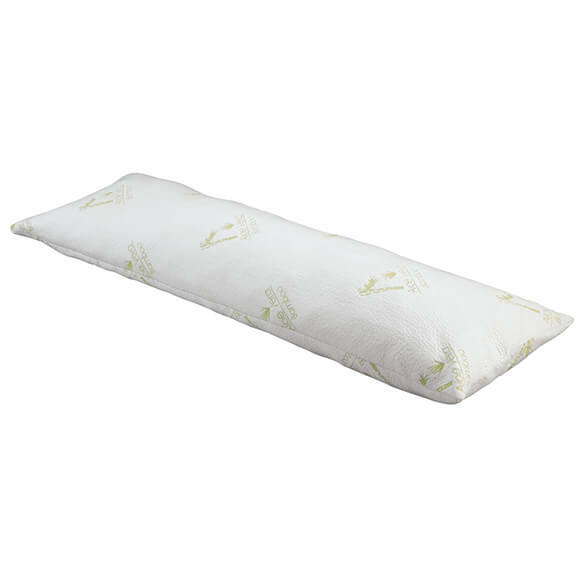 Hypoallergenic, antimicrobial bamboo pillow infused with aloe vera is softer than cotton and wicks away moisture to help keep you cool and dry. Hypoallergenic pillow measures 53”L x 16”W. Cover is machine washable in cold water; tumble dry low heat. Love it. Order a second one. Is in my wishlist again. I would be tempted to buy this product again. I like this product for the most part, but can be slightly shorter and about half as thick as it is that would help. To help me sleep better! I needede a New Body Pillow. I have the smaller bamboo pillow & I love it. I think I'll love the body sized bamboo pillow because it stays cooler than a regular pillow. this body pillow is eeeverythang and then some.